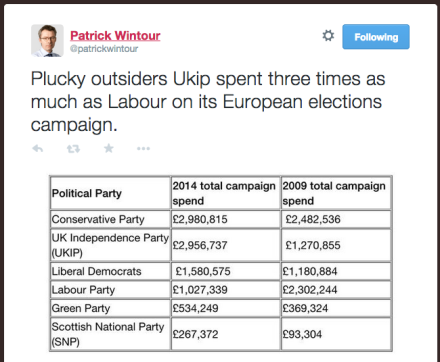 Both UKIP and the Conservative Party outspent Labour by almost three times during this year’s European election campaign. It was UKIP’s first victory in a national election, and Labour came in second place with big spenders the Tories falling behind to third. Labour were the only major party not to increase their election spending from the previous Euros in 2009 (when we finished a miserable third) and were even outspent this time around by the Lib Dems, who only won a single seat. Although many Labour supporters were disappointed to finish second in May, our election spend proved the best value for money, both in terms of votes and seats. This suggests that Labour’s ground game is still by far the best of all the parties, and that our ability to target campaigns is the most effective, even if we don’t have the funds to compete in the air war. As Maya Goodfellow reported yesterday, the Tories have recently changed the law to hugely increase the amount of money that can be spent during an election campaign.